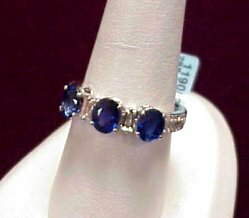 Superb color in these AAA quality, three oval cut matched Blue Sapphires 2.84CT TW, set with 28 pave diamonds (0.15CT TW), two baguettes (0.30CT TW) and constructed in 18KW gold. A very well made ring! NEW ARRIVAL! 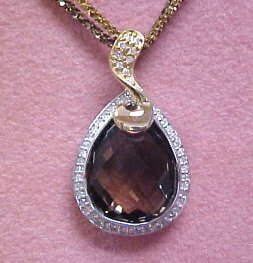 Smokey Topaz and diamond pendant. Stunning 7.43ct smokey topaz set with 53 diamonds (0.23 ctw) and mounted in 14kt white and yellow gold. This chain design allows you to adjust the length from 16 to 18 inches and is colored brown and amber gold. Welcome to our DiamondsHere Daily Specials!.........for Tuesday, January 29, 2019...........Welcome to our DAILY SPECIALS page offering you the opportunity to buy your favorite item at a discount price!.....Enjoy FREE shipping, handling, and insurance with every Specials purchase. . . . . with NO SALES TAX IN OREGON!